we’ll get you an answer! What is the difference between FreeStyle Libre Pro and FreeStyle Libre systems? FreeStyle Libre System is a personal continuous glucose monitoring (CGM) device indicated for replacing blood glucose testing. It aids in the detection of hyperglycemia and hypoglycemia events, and facilitates both acute and long-term therapy adjustments in persons with diabetes age 18 and over. The FreeStyle Libre system is intended for single patient use. 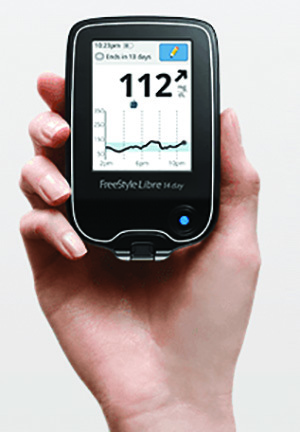 FreeStyle Libre Pro System is a professional continuous glucose monitoring (CGM) device indicated for retrospective analysis of glucose trends and patterns. The system also facilitates therapy adjustments in persons with diabetes age 18 and older, however, the system is intended for use by healthcare professionals, not single patients. Why does the FreeStyle Libre system require a 12-hour warm up period? During the first 12 hours after application, the sensor is acclimating to your body. Continuous glucose readings are unavailable during the warm-up period. What do I do during the first 12 hours while the FreeStyle Libre system is warming up? FreeStyle Libre Reader has a built-in test strip port that utilizes FreeStyle Precision Neo test strips. During the 12-hour warm-up period, patients can use the test strip port to monitor their glucose. Can I start a second sensor when I have less than 24 hours left on my old sensor? In the last 3 days of the sensor life, a “Sensor Ending Soon” message is displayed after the first scan of the day. In the last 8 hours of the sensor life, the “Sensor Ending Soon” message is displayed after each scan. Can the FreeStyle Libre system be prescribed for children? No. Currently the FreeStyle Libre system is indicated for persons 18 and older with diabetes. Can the Freestyle Libre system be prescribed for patients with gestational diabetes? The FreeStyle Libre system has not been evaluated in gestational diabetes patients and is not approved for these patient types. Can the FreeStyle Libre system be prescribed for patients on dialysis? The FreeStyle Libre system has not been evaluated in patients on dialysis and is not approved for these patients. How much do interfering substances alter the FreeStyle Libre system’s glucose readings? Single doses up to 650mg of salicylic acid (Aspirin) or 500mg of ascorbic acid (Vitamin C) are known to have minimal effect on FreeStyle Libre sensor glucose readings. Note: The FreeStyle Libre system is NOT contraindicated for ascorbic acid or salicylic acid. SOURCES: 1. Data on file, Abbott Diabetes Care, Report, Sensor Design Verification Testing, 2. Data on file, Abbott Diabetes Care, Overview of Ascorbic Acid & Salicylic Acid Interference for FreeStyle Libre Flash Glucose Monitoring System. Warning/Limitation: Patients with high levels of ascorbic acid (Vitamin C) or salicylic acid (used in Aspirin) or severe dehydration or excessive water loss may experience inaccurate results with this system. Do patients need to remove the sensor during MRI/CT scan? Yes. The sensor should be removed prior to exposing it to strong magnetic or electromagnetic radiation, such as with a MRI (Magnetic Resonance Imaging) or CT (Computed Tomography) scan. The effect of these types of procedures on the performance of the system has not been evaluated. Can the FreeStyle Libre system automatically calculate/provide insulin dosing/adjustment? No, the FreeStyle Libre system does not automatically calculate insulin dosages. However, the data generated by the FreeStyle Libre system can assist with making treatment decisions. Please refer to the FreeStyle Libre System User’s Guide, interactive tutorial, or in-service guide for examples on making treatment decisions. Is the FreeStyle Libre system compatible with the FreeStyle Libre Pro system? No, The FreeStyle Libre system and FreeStyle Libre Pro system are separate devices and are not compatible with each other. Is the FreeStyle Libre system compatible with smartphones? No. However, as with any new technology, including mobile apps, Abbott is researching a wide variety of potential applications. What components are included in the FreeStyle Libre system? Sensor Kit includes a sensor pack (used with the sensor applicator to prepare the sensor), sensor applicator (applies the sensor to the back of the upper arm), alcohol wipe (to clean the application site) and a product insert (provides instructions on how to apply the sensor). Reader Kit includes a FreeStyle Libre reader (used to start the sensor on a patient and gather their glucose readings), USB cable (can connect to a computer to generate reports, and used to change the reader), power adapter (use with the USB cable to fully charge the battery), interactive tutorial on USB (help users learn how to set up and use the FreeStyle Libre system), operator’s manual (all of the information required to operate the system) and a quick start guide (a guide to get patients started quickly). The sensor is 5mm in height and 35mm in diameter, which is roughly the size of two quarters stacked together. Were there any skin reactions reported by patients wearing FreeStyle Libre sensors? Based on an examination of 48 study participants, a total of 5 subjects (10.4%) reported mild skin irritations, such as erythema, edema, rash, bleeding, itching, induration, and infection around the insertion site and adhesive area. Pain was mostly reported as none with only one instance of mild pain1. 1. FreeStyle Libre User’s Guide. Can users bathe, shower, swim or exercise while wearing a sensor? Yes, the sensor is water resistant and will continue working as long as it is not submerged more than 3 feet or kept underwater longer than 30 minutes at a time. Are there any third party products that patients can use to help sensor adhesion? There are several products that can be used to improve sensor adhesion. Everyone’s skin is different, so patients should try various products to find the right one. However, at this time, the FreeStyle Libre system is not indicated for use with an over-bandage in the US. Torbot Skin Tac™ A hypo-allergenic and latex-free “tacky” skin barrier. SKIN-PREP™ Protective Barrier Wipe Protective liquid dressing that allows skin to breathe so tapes and films adhere better. Mastisol® Liquid Adhesive Clear, non-irritating, non-water-soluble liquid adhesive that secures dressings even in moist areas. *References to third-party products does not constitute or imply an endorsement, recommendation, sponsorship or favoring of any product or manufacturer. Neither Abbott nor any of its affiliates are responsible for the completeness or accuracy of any information regarding third-party products. Abbott and its affiliates make no representations, expressed or implied, regarding third-party products or their manufacturers, quality or suitability for you. Manufacturers’ instructions for use of each product should be followed. The sensor is designed to provide accurate glucose readings for up to 10 days. What if the sensor falls off before 10 days of use? Replace the sensor and start a new sensor. If the sensor falls off early, please call Abbott at 1-855-632-8658. What happens to the sensor after the 10 day wear period? After 10 days of wear, the reader notifies you that the sensor has ended and should be replaced with a new sensor. The user should scan the used sensor to retrieve remaining data and dispose of the sensor. Can a user still scan and get the last 8 hours of data after the sensor has ended after 10 days? The user is provided with one last opportunity to scan the sensor after the 10 days have ended. Once the user activates a new sensor with the FreeStyle Libre Reader, the reader will not be able to read the previous sensor because the reader can only pair up to one sensor at a time. Can users get a glucose reading through their clothing? Yes, users can get glucose readings through clothing by scanning the FreeStlye Libre reader over the sensor. The reader can capture data from the sensor when it is within 1cm to 4cm of the sensor. Users can scan to get their real-time glucose readings as often as they want while the sensor is being worn. A new glucose reading is available every minute. In order to get a 24-hour glycemic picture, users need to scan at least once every 8 hours. If the sensor is recording glucose readings every 15 minutes, does that mean the user will get the same glucose reading if the sensor is scanned again within the same 15-minute interval? No, the user can get an updated glucose reading every minute when they scan the FreeStyle Libre reader over the sensor. What will happen if a user scans frequently, for example, every 30 seconds? Users can scan as often as they want, but new glucose readings are available every 60 seconds. What happens to the sensor if it is worn outside of the recommended temperature range? The sensor will not record glucose results when the temperature is outside of the required temperature range (between 50°F and 113°F). The sensor will begin recording results again when the sensor is brought within the required temperature range. Is there a warranty for the FreeStyle Libre sensors that have fallen off before the 10-day wear period? There is no warranty for FreeStyle Libre sensors; they are sold as is. Patients are encouraged to call Customer Service for product issues at 855-632-8658. The patient should retain the sensor serial number, which is found on the actual sensor or in the reader. How did my patient receive a replacement sensor if there is no warranty? There is no warranty for FreeStyle Libre sensors. However, Abbott is committed to customer satisfaction. Patients are encouraged to call Customer Service for product issues at 855-632-8658. The patient should retain the sensor serial number, which is found on the actual sensor or in the reader. The languages available on the FreeStyle Libre reader are English and Spanish. Language preference is set at first reader set up, and can be changed by going to the Settings menu to change the language settings on the reader. With normal use, the reader can be used for approximately 7 days before it needs to be recharged. There is a battery icon on the FreeStyle Libre reader which will indicate battery life. A Low Battery warning will appear on the FreeStyle Libre reader when it needs to be recharged. Are the glucose readings erased from the FreeStyle Libre reader if the reader runs out of power? No, stored glucose readings on the FreeStyle Libre reader are not lost if the reader runs out of power. How long does it take to completely charge the reader? The FreeStyle Libre reader should fully charge in approximately 3 hours if the battery is completely discharged. What will happen if users do not scan the sensor with the reader within an 8 hour period? If the FreeStyle Libre sensor is not scanned at least once during an 8-hour period, the user will lose the oldest glucose readings. For example, if a user scans the sensor at 1:00pm and scans again at 10:00pm, then the user will lose glucose data between 1:00pm and 2:00pm. The FreeStyle Libre reader will indicate this missing data on reports with a gap on the Daily Trace. The gap in data will impact the statistics on the FreeStyle Libre sensor usage. What happens to the data when entering a different time zone? If the time on the FreeStyle Libre reader is changed by more than 1 hour, a clock icon will show on the display indicating the time change. The scan results screen will not show data in the graph that was collected by the FreeStyle Libre reader prior to the time change, however, the data is still logged into the Freestyle Libre reader and is used in calculations. On the Daily Graph, moving the time forward will result in a gap in the graph while moving the time backward will result in some data being suppressed. In both cases, a clock icon will be shown indicating the time change. What happens to the 8 hour graph if users change the time on the reader? The 8-hour graph will disappear and a clock sign will appear indicating the time change. Does the reader automatically adjust for daylight savings? No, the reader does not automatically adjust for daylight savings. Can users Add/Edit notes to any glucose reading or to the last scan only? Users can only add/edit notes associated with the last scan or last blood glucose strip test within 15 minutes. If the user is adding notes to a sensor glucose result, will an icon appear on the result screen? If a user adds a food note or rapid acting insulin dose, icons will appear on the Sensor Glucose Results and Daily Results screens. What does HI/LO mean when it appears after users scan the reader over the sensor? If LO appears on the reader when users scan the reader over the sensor, it means the reading is lower than 40 mg/dL. If HI appears on the reader when users scan over the sensor, it means the reading is higher than 500 mg/dL. What types of sounds/signals are on the FreeStyle Libre reader? Confirmation Sound - The Confirmation tone is used upon the display of routine information and messaging such as the display of glucose results. This type of signal can follow a user engaged function of the system to provide confirmatory feedback to the user (e.g. successful scan of the sensor). Notification Sound - The Notification tone accompanies situations such as high or low glucose. The Notification signal is used at times where getting the user‘s attention is important to the resolution of a system issue or patient health condition. Reminder Sound - This tone is broadcast upon the display of a user defined reminder or during system conditions that do not necessarily require an immediate response from the user. Repeated Reminder - This signal is broadcast when a reminder is received or shows up on home button press. It vibrates for 30 seconds. Confirmation Vibration Signal - The Confirmation vibration signal is a vibration alert that is used upon the display of routine information and messaging such as the display of glucose results. This type of signal can follow a user engaged function of the system to provide confirmatory feedback to the user (i.e. successful scan of the sensor). Notification Vibration Signal - The Notification vibration signal is a vibration alert that accompanies situations such as high or low glucose. The Notification signal is used at times where getting the user‘s attention is important to the resolution of system issue or patient health condition. Reminder Vibration Signal - The Reminder vibration signal is a vibration alert that is broadcast upon the display of a user defined reminder or during system conditions that do not necessarily require an immediate response from the user. Repeated Reminder Vibration Signal - This is a vibration alert that is broadcast when a reminder is received or shows up on home button press. It plays for 30 seconds. What is a trend arrow? How does it work? What does it tell users? The FreeStyle Libre system displays a Trend Arrow with each glucose reading which tells users which way and how quickly glucose levels are changing. So, at any given time, users not only know what their glucose level is currently, but also which way it is heading. Depending on the direction of the trend arrow, users can find out if their glucose levels are changing gradually (0 to 1 mg/dL), moderately (1 to 2 mg/dL), or rapidly (more or less than 2 mg/dL). Is there a warranty for the FreeStyle Libre reader that has fallen off before the 10-day wear period? The FreeStyle Libre reader has a 1-year warranty from the date of manufacture or the original date of purchase (with proof of purchase), whichever is later. Patients are encouraged to call Customer Service for product issues at 855-632-8658. Patients will be given a voucher for a free Reader which can be redeemed at the pharmacy and requires a prescription. Where are the last 3 FreeStyle Libre sensor serial numbers found on the reader? What are the differences between interstitial fluid (ISF) and blood glucose (BG) readings? Interstitial fluid glucose measurements are taken from the fluid within tissue while blood glucose measurements are taken directly from the blood. Glucose is transported from the blood into the tissue, so during times of changing blood glucose, when ISF and BG measurements are taken simultaneously, the readings are likely to be different. The ISF measurements are likely to be delayed compared to BG measurements. In a situation where blood glucose levels are rapidly changing, should the FreeStyle Libre system or a blood glucose meter (BGM) be used? If you suspect your blood glucose is changing rapidly, check using a blood glucose meter and test strip. For your convenience, the FreeStyle Libre reader has a built-in meter that utilizes FreeStyle Precision Neo test strips. FreeStyle Precision Neo test strips are available over the counter at retail pharmacies. Is FreeStyle Libre system covered under Medicare? What commercial insurance plans cover FreeStyle Libre system? Abbott is committed to working with commercial insurers to make FreeStyle Libre system available to people with diabetes across the US. Once more information becomes available, we will let you know. Are healthcare providers reimbursed under CPT codes*? Reimbursement is dependent on the insurance company. Please check the reimbursement policy with the payor. CPT Code 95249: Ambulatory continuous glucose monitoring of interstitial tissue fluid via a subcutaneous sensor for a minimum of 72 hours; patient-provided equipment, sensor placement, hook-up, calibration of monitor, patient training, and printout of recording. (Do not report 95249 more than once for the duration that the patient owns the data receiver. Do not report 95249 in conjunction with 99091, 0446T). CPT Code 95251: Ambulatory continuous glucose monitoring of interstitial tissue fluid via a subcutaneous sensor for a minimum of 72 hours; analysis, interpretation and report. (Do not report 95251 more than once per month. Do not report 95251 in conjunction with 99091). * CPT code definitions sourced from American Medical Association CPT Code Book 2018. CPT is a registered trademark of the American Medical Association. Can I download my patients’ FreeStyle Libre data into Glooko? No, the FreeStyle Libre reader can only be downloaded to LibreView cloud-based software or FreeStyle Libre desktop software. The FreeStyle Libre system is not compatible with other glucose tracking software. I live in the US but I bought my FreeStyle Libre reader in Europe. Can I use US sensors with my reader now that they are available? A FreeStyle Libre reader purchased in the United States is only compatible with FreeStyle Libre sensors purchased in the United States. Why is the label different for FreeStyle Libre system in the US versus other countries? Each country’s regulatory body, including the FDA, may take a different approach when reviewing medical devices for safety and efficacy. Why does FreeStyle Libre have a 10 day sensor duration in the US and 14 day sensor duration outside of the USA? Regulatory bodies have different methods for reviewing medical device safety and efficacy. It is common for product indications to differ by country, and we chose to make product modifications to ensure Americans with diabetes could have access to the FreeStyle Libre system as soon as possible. Why does the FreeStyle Libre system have a 12 hour warm-up period in the US and a 1-hour warm-up period outside of the US? Is the FreeStyle Libre system available in the US the same or different than what is available outside the US? The FreeStyle Libre System available in the US is different than the FreeStyle Libre system available outside of the US. However, the underlying technology (ie, Wired Enzyme Technology) is the basis for the FreeStyle Libre system globally. All readers and sensors have the same design but product features may vary. Why has eA1c been removed from the FreeStyle Libre and FreeStyle Libre Pro software reports? Based on the evolving understanding of the estimated A1c statistic, we have evaluated it and decided to remove eA1c from all reports. However, we are considering other options for alternative calculations and will provide additional messaging when available. What do I use now instead of referring to eA1c? What can I tell my patients to use? Estimated A1c is not a replacement for a patient’s laboratory hemoglobin A1C test. FreeStyle Libre and FreeStyle Libre Pro Desktop Software provides other measurements that can be useful to consider for historical review of your patients' data such as time in range, average glucose, hypoglycemia risk, and glucose patterns. Will eA1c be added back to FreeStyle Libre and FreeStyle Libre Pro Desktop Software in the future? Will Desktop Software be creating a similar calculation in place of eA1c? At this current time, there are no plans on adding eA1c back to reports within FreeStyle Libre and FreeStyle Libre Pro Desktop Software. We are currently evaluating alternative calculations in place of eA1c and will provide additional messaging moving forward. Are there any other calculations in FreeStyle Libre and FreeStyle Libre Pro Desktop Software that will be removed? No, there are no other plans of removing additional calculations within FreeStyle Libre and FreeStyle Libre Pro Desktop Software at this time.